donovan could wear an aqua- and- white gingham tablecloth shirt, two weeks of facial hair growth with fried egg stuck in it, and id still be fond of him. and anwar is something. The chemistry of the main characters is excellent, the dialog is snappy, and the plots are juicy. Can't wait until the following seasons come out on DVD. 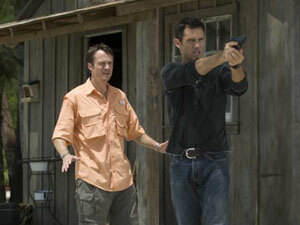 Burn Notice, is one of the most exciting and fun series I've seen in a very long time. Bruce Campbell and Sharon Gless steal every scene they are in. Great hidden gem of a show. "... LET ME TELL YOU A STORY"
This is a great show with a great cast, and it immediately can count itself amongst USA network classics like Monk and MacGyver. A funny, down to earth intelligence officer/agent has been "burned" by his handlers (declared unreliable) and is confined to Miami where he must work under the table as an "investigator" while he figures out his situation. Its not really that deep or ground breaking, but it works as an original series. Sometimes the truth hurts. In these situations, I recommend lying. 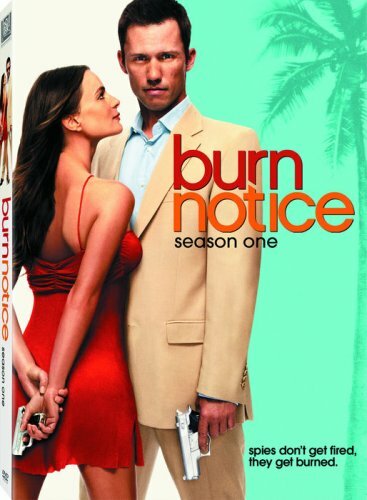 There are some very nice features in the Burn Notice set, including the original audition footage done by Jeffrey Donovan and Gabrielle Anwar. I'm thinking that Bruce Campbell and Sharon Gless didn't have to audition -- I mean, really, they're so accomplished, would you ask them to do a reading? Too bad, because you just know that a Bruce Campbell audition would be riotous. And, for Sharon, she was fooling around with a funky wig for Madaline. The wig, in fact, is on her head in the pilot -- then gone forever! Matt Nix, creator of Burn Notice, nixed it. The extras include some very casual -- but enjoyable -- episode commentaries that include all the principals, i.e. Nix, Donovan, Anwar, Campbell and Gless. There's a gag reel, a character montage, and a Girls Gone Burn Notice feature. The latter is clearly there to pump up the Miami/skin factor. The real joy of the DVD set is actually all 11 episodes, starting with one of the best pilots I've seen in a long time. What made it so good is that all the elements of the show were laid out, starting with how Michael got burned and left in Miami, how Fi and Sam figure into his life, why he's stuck in South Florida, the complication with his loving, but annoying mother, and how Michael is going to survive. By the end of the pilot, in a very concise and unforced way, Matt Nix has set it all up perfectly, right down to the yogurt in Michael's industrial loft over a nightclub. Every episode includes formula elements -- which I think is a good thing in this genre -- like Michael's voiceover information, the tongue-in-cheek titles ("Barry - Money Launderer"), and the transition images that include attractive use of the Florida locale, like those girls in the bikinis (which do nothing for me, but I'm sure are eye-candy to the guys).